Why I haven’t seen this video before, and why it has not gone viral, is beyond me. Listening to this speech, I feel as relieved as I did listening to Reagan in the late 1970s explaining calmly and clearly to the American people how we were being hoodwinked by politicians who promised to protect us if only we would send them more money, more power, more steps toward socialized medicine. Senator Cruz describes, in plain language, the machinations of what he terms “the Washington Cartel” of K Street lobbyists and politicians. (The speech lasts about 40 minutes, but keep listening for his superb answer to why we might expect him to keep his word). It’s easy to see why establishment Republicans — and Donald Trump, by the way — might not want you to hear this. Incidentally, he mentions insurance companies. Insurance companies are the tip of the iceberg. We know that hospitals and professional organizations and others are in on the game too. And the game isn’t only about greed, as the consumerists would have you believe. Often the objective is ideological — the misguided desire to fundamentally transform society; to take a health care system that is malfunctioning largely because of government meddling, and try to “fix it” with more meddling. Enroll America: much has been written about this alliance, but please note the involvement of hospitals — faith-based, non-profit as well as for-profit. 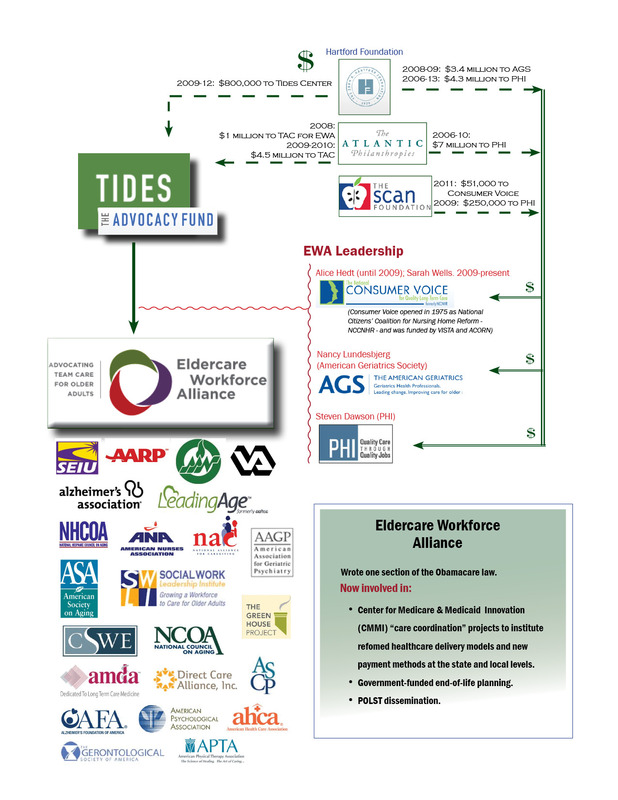 Coalition to Transform Advanced Care (C-TAC): Note the involvement of AARP, insurance companies, bioethics groups, The list includes seemingly innocuous groups such as Easter Seals, whose VP for Government Relations, Katy Neas, is a former aide to Tom Harkin. She is wife of Ralph Neas, former head of People for the American Way. American Cancer Society’s lobbying arm, Cancer Action Network, is a principal member, and supports Obamacare. C-TAC has launched faith-based “community action projects” in Oakland, Detroit, and Washington DC. In Oakland, C-TAC has assigned an old Alinsky-affiliated group of churches to be the cornerstone of a program to nudge chronically ill patients and their caregivers into advance care planning. C-TAC is garnering new funding from Pete Peterson, generally thought to be conservative. Yes, his foundation has thrown a few bones to a few conservative groups, but he sends far more money to leftist groups such as Center for American Progress and Brookings Institution. Note who is on the advisory board for the Peterson Center for Health Care. Leadership Council of Aging Organizations: Altarum Institute (Joanne Lynn, wife of Barry Lynn of Americans United); National Association for Homecare & Hospice; LeadingAge (a key member of Eldercare Workforce Alliance, mentioned in a post several years ago). American Society on Aging has been receiving funding from Compassion & Choices (formerly known as Hemlock Society). National Quality Forum and the National Priorities Partnership. Please listen to Cruz’s speech, and share it with a friend. This entry was posted in C-TAC, Legislation, Obamacare - Affordable Care Act - ACA, The Administrative State and tagged CMMI, community organizing, cronyism, federally subsidized, grassroots bioethics, health reform, Obamacare by Ione Whitlock. Bookmark the permalink.